All non mission essential personnel were evacuated from 25 buildings aboard Vandenberg Air Force Base today when a fire began at approximately 11:45 a.m.
Now covering more than 300 acres, fire teams from Vandenberg, Santa Barbara County, Lompoc, and Montecito are battling the blaze as it moves to the southwest. With 30 to 55 mile per hour winds stoking the fire from the northeast, crews have not yet been able to contain the fire, although 10 air tankers – including a DC-10 – six dozers, five helicopters, and 20 engines have been dedicated to the effort. The number of fire personnel on the ground has not yet been ascertained, nor has the cause of the fire, which is under investigation. 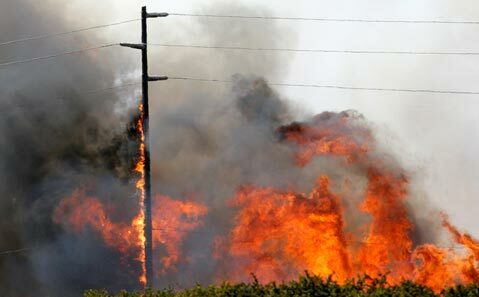 Officials believe it may be linked to downed power lines near where the conflagration originated.